The following story is about a Sahaja Yoga program that was held recently at Alandi, in Maharashtra State, India. 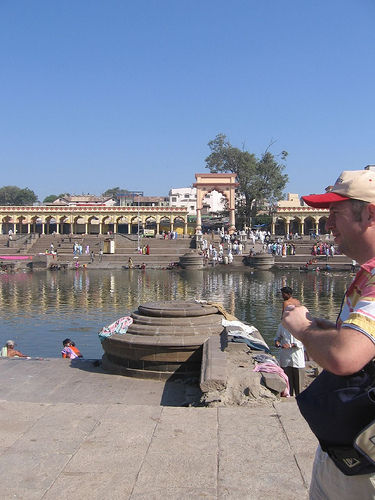 Alandi is the place on the Indrayani River where Saint Gyaneshwar took his Samadhi. The account was written by Arno from Pune in Maharashtra. The photograph shows a Sahaja yogi visiting Alandi. “Shri Mataji has told us Sahaja Yogis that Saint Gyaneshwar (1275-1296) was the incarnation of Lord Kartikeyya. He was – after obtaining permission from his elder brother and guru, Nivrittinath – the first one who openly spoke about the Kundalini. He was born, like so many great saints, in Maharashtra and spoke about God in the local language, Marathi, not in the Sanskrit used by the priest caste. In the 6th chapter of his treatise, Bhavarthadeepika (commonly known as the Gyaneshwari or Jnaneshwari) he described the Kundalini in all details. Therefore, the Brahmins forbade everybody except themselves to read this chapter. “At the age of 23 Sant Gyaneshwar took his Samadhi, which means he left his physical body and merged into God Almighty. This happened in the year 1296 at Alandi, about15 km from Pune, where yesterday, 25th February 2008, a Sahaja Yoga Program was held. “A couple of days before the program, permission and Blessings were taken from Shri Adi Shakti Mataji in Prathisthan. Shri Mataji gave Her full Blessings. The program took place in a school about 500 m from the place on the banks of a river where Gyaneshwar took his Samadhi. The program was attended by about 700 people: simple people, dressed in cotton kurtas and saris, many of the men wearing the typical white “Gandhi cap”, also many children. “After an introduction by a Sahaja Yogi uncle and several bhajans sung by the Pune Bhajan group, an excerpt from Ramayana, a television series by Ramanand Sagar, was shown. This excerpt is used in Sahaja Yoga programs all over India and shows Luv and Kush receiving their Kundalini Awakening from their Guru, Valmiki Rishi. So, it shows to ordinary people that Kundalini Awakening is very much based on their own tradition and religious and cultural heritage.